Between rising security risks, natural disasters, climate change, business application slowdowns, IT outages, and unpredictable man-made threats, it’s not a question of whether, but when, a serious security or performance issue with your digital or physical infrastructure will endanger the health of your business or the communities you serve. The results can be immediate and devastating. For a business, they may include lost revenue, reduced employee productivity, a drop in share price, regulatory fines, and reduced customer satisfaction and retention. For a public safety agency or a health care provider, the stakes can be life or death if a doctor or nurse fails to receive an urgent order, or the public isn’t notified of an emergency evacuation. The Everbridge Critical Event Management Platform is built on the most secure, scalable, and reliable infrastructure with multiple layers of redundancy to provide real-time threat detection, situational awareness, integrated response, and collaboration capabilities all with a single, enterprise-wide view. Identifying a threat before it reaches critical mass and understanding how it might impact vital assets is a challenge facing security and safety professionals. In the past, a common challenge was having enough intelligence data to make accurate predictions. Today, the opposite is true – the amount of available data is often overwhelming! With crime, severe weather, and incident data feeds coming from law enforcement and federal agencies, photos and videos coming from people on the front line, topics trending on social media, and logistical information originating from internal systems, it can be almost impossible to locate a real signal among all the noise and chatter. Critical Event Management provides an easy way to aggregate hundreds of threat data feeds and visualize the intelligence data within the context of an organization’s assets. This contextual understanding is vital to understanding the relationship between threat data and the individuals or facilities in harm’s way. Who is needed to respond? Typically, this requires access to an HR contact database, walking over to the ‘on-call’ white board and manually reaching out to the correct people. This can be a time-consuming and opaque process. There is no information on the proximity of that person to the critical event, or if a person has skills such as CPR that could aid in the response. 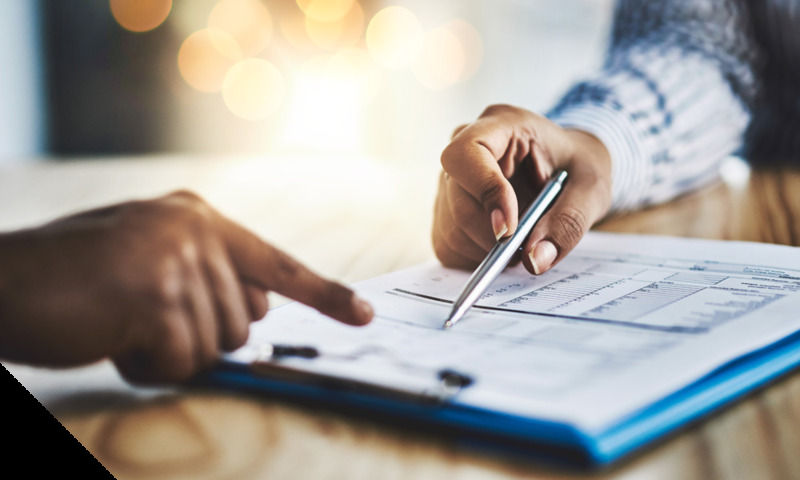 Critical Event Management ensures ahead of time that certifications, skill sets, or on-call availability is automatically included with contact information to save valuable time and minimize errors in the middle of a crisis response. 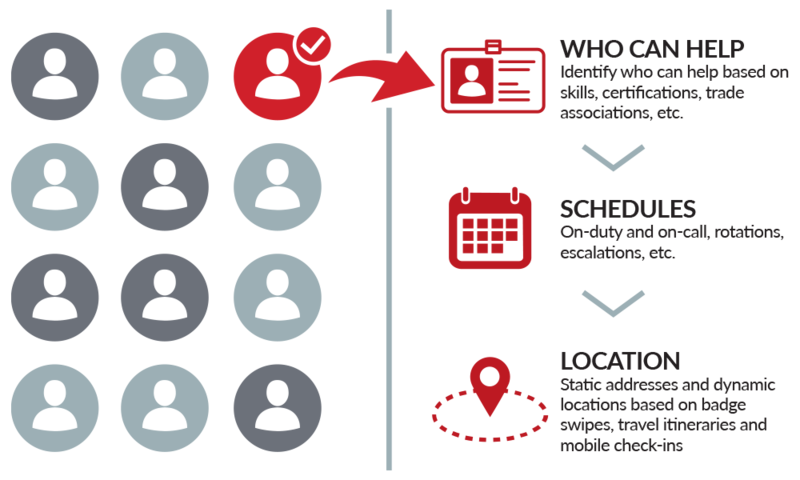 Going even further, data from building access systems, wifi hotspots, corporate travel systems, among others, can be used to create a profile of where a person was ‘last known’ and where he or she might be going in a unified view. With Everbridge’s integrated solutions, information can be visualized on a threat map alongside key assets like people, plants, branch offices or partner locations and help determine who is actually in danger and who can respond the fastest. The emergency response then becomes targeted and more effective. Minutes matter when responding to critical events. To reduce the mean time to repair a critical event organizations need to be prepared to execute their standing operating procedures (SOPs) fully within a Critical Event Management platform. When seconds matter, a Critical Event Management platform can automate sirens, alarms, digital signs, and messages based on event type, severity, and location. Every activity from having conference lines instantly created to enable collaboration and speed response time. Or customized escalation policies are automatically engaged if a protocol is broken. Improved collaboration from response team members can identify missing resources, uncompleted task items and personnel who are unable to respond. 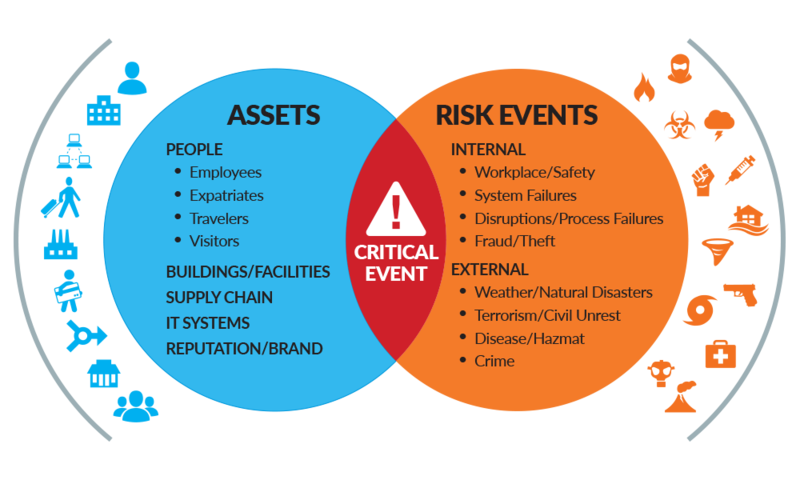 All items that allow organizations to understand what is happening and why so that they can easily manage resources, minimize impact, and prevent incidents. It’s not uncommon for critical response teams to think that a critical event is over once the immediate crisis has ended. After all, they are often the ones pushing themselves to exhaustion and sometimes risking life and limb to protect their neighbors, colleagues, community reputations, and company brands. 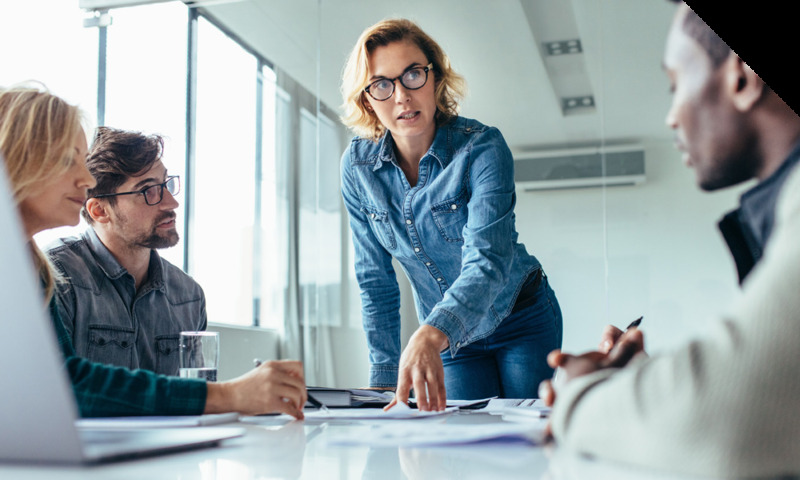 In the aftermath of a critical event, however, it’s important to review the effectiveness of the response and look for ways to drive improvements. Which tasks took too long? What resources were missing? How many times did people respond quickly? With access to a Critical Event Management platform, team performance, operational response, benchmarking data, and notification analysis are all captured within the system and are available in a configurable dashboard or in after-action reports for analysis. Continuously looking for ways to better prepare and respond to critical events will not only improve performance when similar events occur again, but it will also improve response effectiveness when unforeseen events strike. With the right historical data organizations can start to predict the right response resources, protocols and activities to reduce the impact.